Books4Everyone loves what you’ve done so far, and they want to make their app even more robust by showing off book ratings right on the home page. In order to bring this to their advertisement team's attention, they have requested a new component for the home page. Just like before, they provided you with a SQL query that you need to turn into a SOQL query. Before we write our query in Apex, let’s look at the SQL query. You know Book is related to Recommendation with a master-detail relationship. You write the following query. First, add the new SOQL query to the Apex controller class. Create a new component by clicking File > New > Lightning Component. Name your new Lightning component Books4EveryoneRecommendations. Inside the aura:component tags, add the following code. Our final step is to ensure our query worked as expected by adding our component to the homepage. 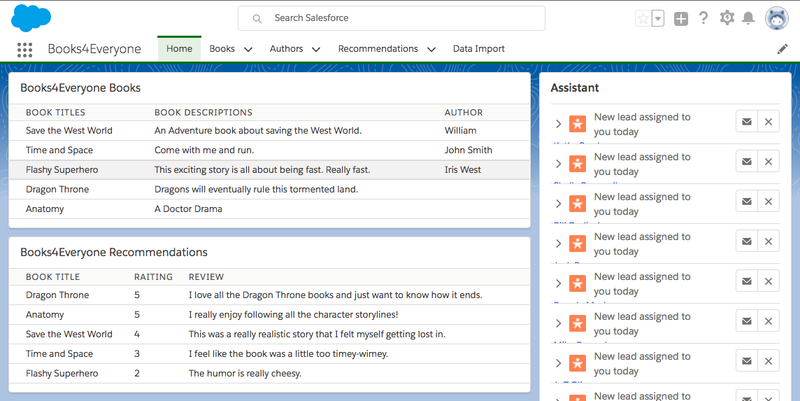 On the left side of the Lightning app builder, find Books4EveryoneRecommendations in the list of custom components. Drag the component on to the page.